How would the stars, nebulae and planets in the cosmos sound like? It would become a life-long quest of Belgium synthesist Patrick Kosmos (aka Patrick Wille De Wael) who composed classic cosmic music from the early ‘80s on. Purchasing his first synth around 1973 he started transcribing his thoughts and feelings on space travel in music. Creating his unique music at home was one thing, playing and improvising it live-in-concert in special places became the true challenge and passion for this cosmic traveller. While improving his musical skills Patrick was a roadie for various bands and a light and sound engineer elsewhere. Covering up the brand names of his synths at concerts was also common practice for Patrick as he had no wish to do any promotion for the respective manufacturers nor did he think one brand was better than the other. Around 2002, Patrick retreated as an electronic musician and focused on easy-listening and chill-out projects. Unfortunately, Patrick passed away on February 2 2015, only 55 years old. Ron Boots Finally, here is a first review about Patrick Kosmos! And it's to Ron Boots that we owe it. Groove's boss has been very interested by the EM from Belgium since he has reissued the too good Let the Night Last Forever from Walter Christian Rothe. Two other reissues of WC Rothe albums followed, as well as a reissue of an album by AGE. And now, it's Patrick Kosmos' turn! Discrete at the level of promotional activities, Patrick "Kosmos" Wille De Wael has become better known with appearances at various festivals or by giving concerts in places quite typical for the genre (churches, planetariums, etc...). It was during these performances that he sold his cassettes, several of which contained his live recordings. His trademark! With the help of his brother Philip, Ron Boots plans now to reissue the catalog of Patrick Kosmos. And the adventure begins with “Monument”, an album recorded in concert at the legendary KLEM-Day of 1988. Floating from cos mos, the title-track drifts to our ears with the usual cosmic noises and sonorous filaments which draws lines of fire in the dark. Strange noises are added to this opening rich of its electronic discoveries of the time, whereas strata dragging a heaviness of weeping violins modulate a slow interstellar procession. Pulsations, very spaced, get graft to the movement which turns into a fascinating Berber song. This song hums a melody which seems ancestral and adorned of rattling and of good percussion effects. If the movement remains of a magnetizing slowness, it hosts other percussions, more vivid, and resonant sequences as the song becomes more fluty. This slow opening goes over the first 10 minutes of "Monument". Subsequently, the rhythm gets lively with a battle of rattling and drums in glass tones and whose tumult accentuates the velocity of an ascending line of bass pulsations. The music explodes more than the rhythm when the 10 minute's point arrives. The charge comes from a sy n th and its angry solos which hoot like extraterrestrial effects in the Twilight Zone of the 60's. The percussions are still in mode tap-dancing while the sequences spit weight and the orchestrations add a dramatic momentum as strong than disturbing. A deep and intense moment which deserves its ethereal finale. "Sunburst" offers a less homogeneous structure. After an ambiospherical opening unique to this time, the music explodes into a good cosmic rock with orchestral arrangements, at the level of synth pads which sing while flying with their violin wings. Even though the percussions display this soulless drum machine tone, some are simply delicious and lead to a lively structure with sequences of contrasting hues, either be bass tones or glass tints. These sequences are the cradle of a long interlude with no sustained rhythm, unfolding rhythmic refrains which sparkle like a mad xylophone. They also guide us to the 2nd phase of "Sunburst". 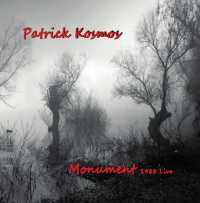 Towards its explosions of philharmonic perc u ssions, its ephemeral rhythms and its fluty songs which show Patrick Kosmos' skill on Mellotron, whose cottony mists remain throughout the setting of this “Monument”. Majestic in its seraphic envelope, "Silence" spreads out its melancholy coat sewn into harmonies guided by a synth, its shrill waves and its perfumes of a sharp flute. Everything melts into a beautiful lullaby whose radiation exceeds our borders. Impossible to not like it, "Slowmotion" is a title that makes me think a lot about Robert Schroeder, period 82-83. The rhythm is as slow as the title-track, but more animated by an excellent sequencer game, for the time, and its many percussive effects. "The Last Monument" takes a little bit of the essences of the title-track but in a more lento vision. A vampiric bass line modulates an overwhelming procession under a sky filled of stellar effects. Little by little, filaments emerge from this slow approach and they flee towards an acceleration of the movement. The percussi ons get stir up at the same time as the sequences and the astral harmonies get lost in a fiery rock fed by good, thunderous and sharp solos. On a purely electronic rhythm, this rock phase of the guitar merges with a synth and its orchestrations which take an impressive form of solos. This is the war between this synth and this guitar, nailing one of the most violent heavy cosmic rock in the spheres of modern EM. This violent 5 minutes looks for its ambient phase a little before the point of 11 minutes, bringing "The Last Monument" to a cinematic, dramatic and very worthy of an album that gave me chills more than once. Quickly, the next chapter!